Unlike the edit-button which brings me to the Suggested Edits-queue when an edit is pending, the close-button always open the VTC-dialog. I'd prefer to be brought to the Close Votes-queue if there are close votes already, because only here I can vote to leave the question open. 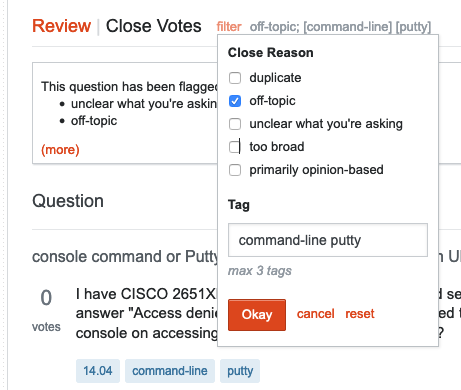 So how can I open a certain question in the Close Votes-queue? Unfortunately, only mods can do that. See this feature request on Meta Stack Exchange. When I want to find the review of a post, I look at the review history page and scroll through the recent pages to find the post I want (Ctrl+F is helpful), but this page only shows the history of reviews by everyone to users who have >10k reputation - otherwise it shows you your own reviews only, which is not helpful for this purpose. This also doesn't work if nobody has reviewed the post yet (for example, it received close votes from users who landed on the page; some questions get closed before anyone reviews them in the queue, but in such cases the closure is usually correct). Only completed reviews are accessible in the post's timeline, so that also does not help. In short, there is no easy way to vote to Leave Open from a question page. If you post the question link in the Downboat I or someone else will be willing to look for it in the history or let you know if we encounter it in the queue and give you a link. 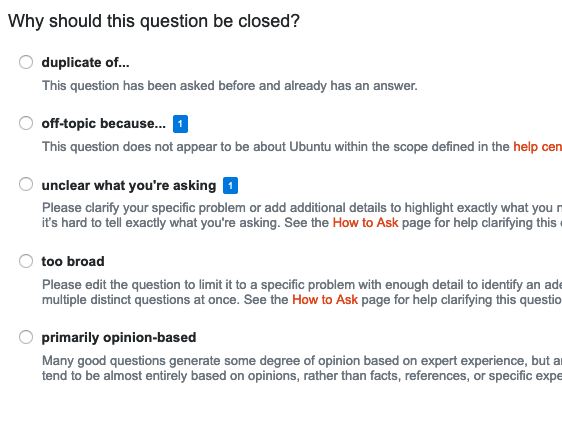 To add to Zanna's answer, since we are <10k rep users, what I usually do is filter the Close Votes queue to certain criteria of a question I want to vote on. However, the 14.04 is quite broad so I usually ignore it. Next, I go to the Close Review queue and click on the filter link at the top near the title. Finally, I filter based on the previous criteria so I get that question in order to review it. P.S. This isn't a 100% optimal solution, sometimes I may need to review a couple of questions first before reaching the one I was searching for. And sometimes the tags all too broad for this to work at all. But more often than not, this method works. Not the answer you're looking for? Browse other questions tagged support review vote-to-close . What effect does voting to Leave Open have?